Bosch delivers an open IoT cloud to efficiently develop and manage industrial apps for automotive, manufacturing, supply chain, smart homes, etc. Provide a platform-agnostic middleware layer and ready-to-use cloud services to accelerate the release cycle, enhance security, and reduce complexity of IoT apps across a variety of industries. Based on Cloud Foundry, the Bosch IoT Cloud is reported to connect more than 6 million devices and machines. Current applications include detection of parking spaces, insurance rebates for careful drivers, connecting smartphones with heating, lighting, and smoke alarms at home. Backed up by Eclipse IoT to address specific IoT needs, the open cloud platform enables Bosch and its partners to develop IoT solutions for energy, construction, logistics, agriculture, as well as automotive and manufacturing industries. Using a cloud-based PaaS ensures elastic scaling and allows for Agile adoption of new technologies, saving time and resources. To succeed in the IoT domain, one has to partner on a broad scale, e.g., join strategic alliances or open-source development communities. Relying on accepted standards and open-source technologies can help to maximize the scope of a project and avoid the need to spend time on training developers. Robert Bosch GmbH is a 130-year-old German industrial giant, globally known as a supplier of automotive parts and solutions, high-end home appliances, and power tools. The company employs roughly 390,000 associates worldwide (as of December 31, 2016). In 2016, its revenue reached 73.1 billion euros. 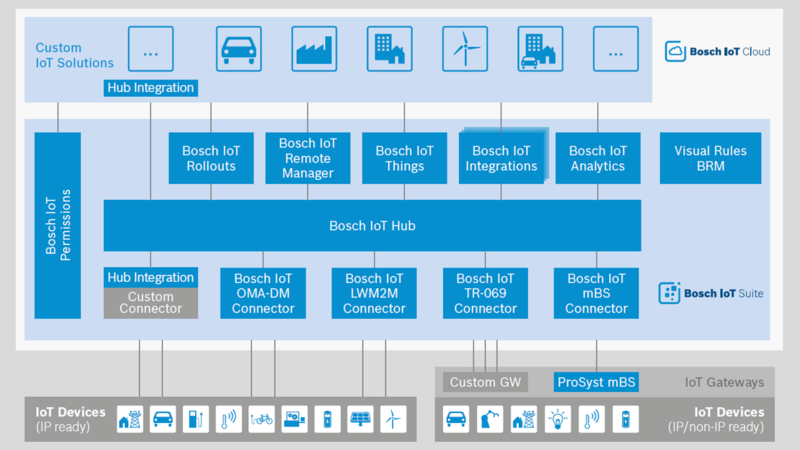 Bosch Software Innovations is the company's subdivision focusing on the IoT practice. The lab's experts are behind the development of the Bosch IoT Suite. So far, Bosch Software Innovations has designed, developed, and operated 250+ international IoT projects. Since 1995, Bosch has produced about 7 billion sensors for microelectromechanical systems (MEMS). Every day, about 4 million MEMS sensors come out of the company's facilities. The number of devices connected to the Internet of Things (IoT) is growing at an exponential rate, reported to have reached more than 8 billion in 2017. Moreover, the figure is expected to increase up to 20 billion by 2020. The implications are already evident and raise certain concerns, especially among those companies that specialize in IoT solutions. 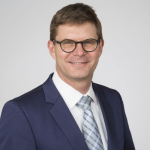 Steffen Evers, the Head of Open-Source Services at Bosch Software Innovations, highlights two major problems in the IoT space. Firstly, connected devices are produced by a lot of different manufacturers, cater to different purposes, and use a variety of protocols. This means that devices lack unified standards. Secondly, connected devices generate vast amounts of telemetry (e.g., temperature, speed, etc. ), as well as command and control data. As new smart devices and machines join the network, this amount of data also increases. A Cisco white paper estimates that the total data generated by any IoT device annually will reach 600 ZB by 2020, up from 145 ZB in 2015. Since 1995, Bosch itself has produced about 7 billion sensors for the MEMS systems. Approximately 4 million MEMS sensors come off the company’s conveyors daily. To handle the data from the devices and unify various protocols the sensors use, the Bosch realized the need for a middleware layer. 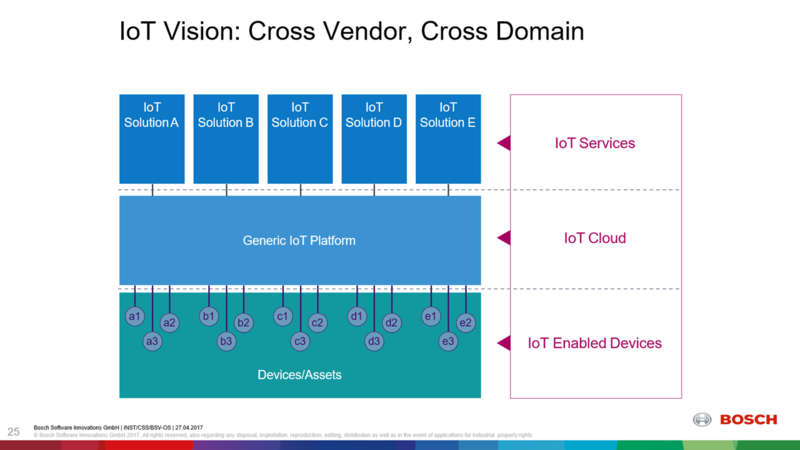 According to Steffen, this would help to enable cross-domain and cross-vendor support, covering most—if not all—IoT devices, both existing or likely to appear in the future. 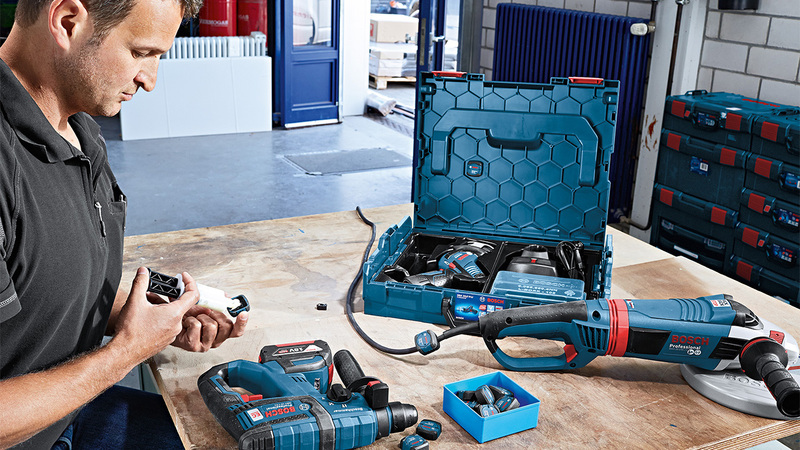 To address the need, the company developed Bosch IoT Suite. Looking for a way to make the suite available as a PaaS to its partners and customers, Bosch decided to employ Cloud Foundry. Bosch IoT Analytics simplifies the collection and reading of data metrics. Bosch IoT Hub enables secure and reliable messaging for device-related communications. Bosch IoT Permissions provides user management and access controls for IoT applications. 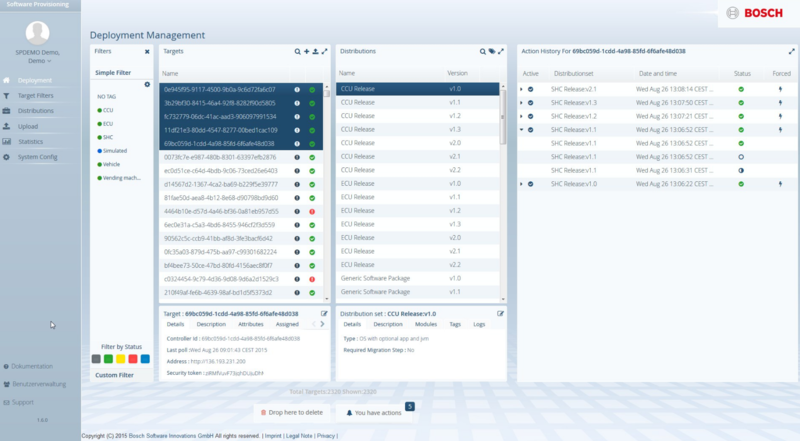 Bosch IoT Remote Manager enables back-end management for IoT devices. Bosch IoT Rollouts manages software and firmware updates in a secure manner. Bosch IoT Things provides an inventory of managed IoT assets. To deliver Bosch IoT Suite as a PaaS to its customers and partners, the company built Bosch IoT Cloud. Rather than opting for a private third-party solution and potentially getting vendor-locked, the company made a decision to build a cloud platform of its own. The platform was meant to ensure scalability of the services and their compatibility with a wide range of IaaS providers, so that the company’s customers were free to deploy their apps to an infrastructure of choice or change vendors smoothly. 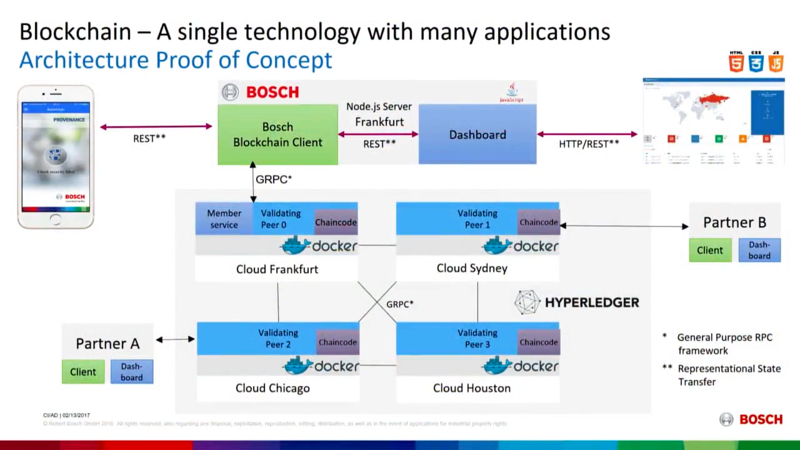 For the purpose, Bosch IoT Suite was integrated with Pivotal Cloud Foundry. The cloud is operated in the company’s computing center near Stuttgart. 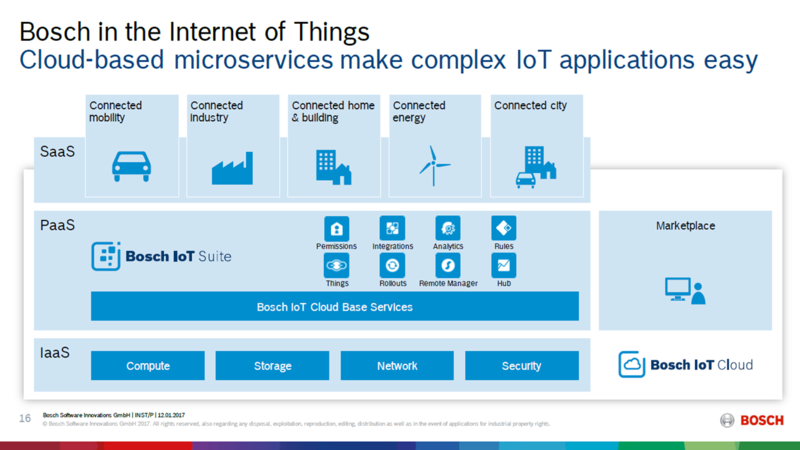 The launch of Bosch IoT Cloud was announced on March 9, 2016 at the Bosch ConnectedWorld event in Berlin. In September 2016, Bosch became a Silver member of the Cloud Foundry Foundation. Joining the community, the company aspires to assist in improving the features and usage of the PaaS for IoT scenarios. Initially tested on internal projects, the Bosch IoT Cloud is offered to external customers and partners starting from 2017. 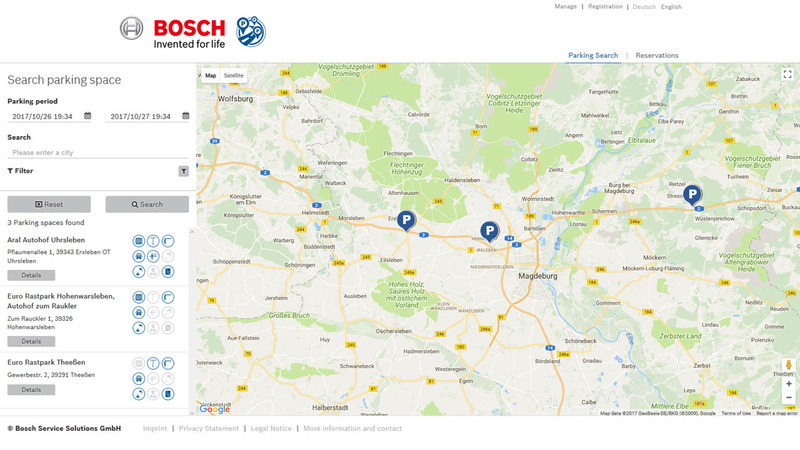 In February 2017, Bosch and IBM announced a collaboration to make Bosch IoT Suite available on IBM Bluemix and IBM Watson for the companies’ customers. As a result of this partnership, for instance, auto manufacturers got the opportunity to schedule and organize software updates to millions of vehicles in a secure and managed fashion without the need to bring the vehicle to a workshop. White goods manufacturers can also remotely send updates to batches of thousands of house appliances, granting consumers access to the latest updates, services, and offerings (e.g., automatic reordering of detergent). To address specific IoT challenges—connectivity, support for domain-specific protocols, large-scale messaging, device management, integration, etc.—Bosch is also using the Eclipse IoT platform. (Bosch is a strategic member of the Eclipse Foundation since November 3, 2015.) 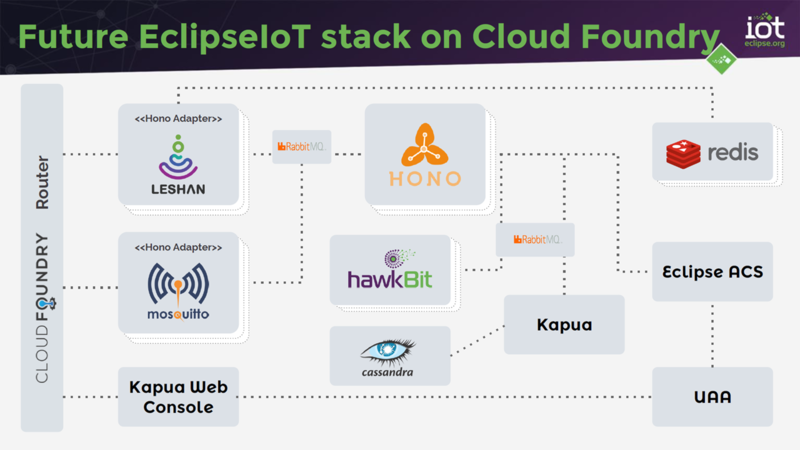 As an active contributor of the Eclipse IoT Working Group, the company assists in developing several IoT projects, including Vorto, Hono, hawkBit, Leshan, and Ditto. At Cloud Foundry Summit Europe 2016, Executive Director at the Eclipse Foundation Mike Milinkovich delivered a presentation on how Cloud Foundry and Eclipse IoT services work together. Handling multiple protocols that devices use for communication, including TCP, UDP, and proprietary ones. The support for the TCP protocol was enabled through Cloud Foundry TCP Routing. High isolation and lack of networking on the container level prevented building clusters during application runtime. To establish direct app-to-app communication, the container-to-container networking was implemented. There was a lack of production-ready backing services that can support IoT applications. BOSH helped to automate rollouts and management of backing services, as well as infrastructure abstraction. According to Bosch, it is planning to extend the initial set of services available via the platform through establishing new partnerships for the purpose. 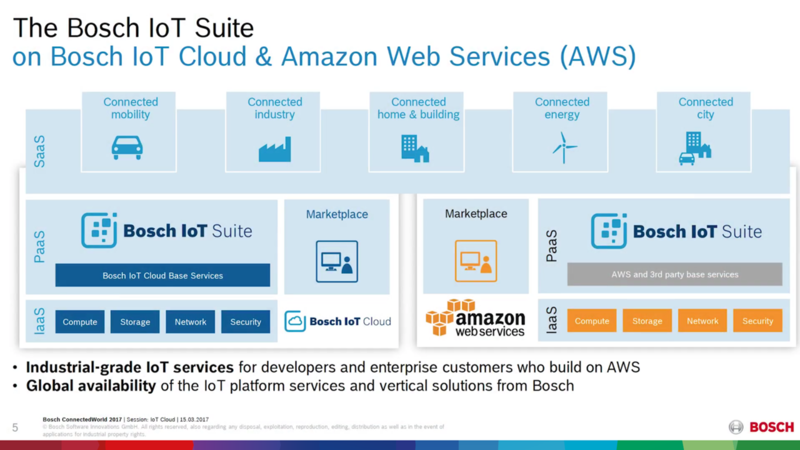 Bosch IoT Cloud enabled the company and its partners to deliver a variety of innovative solutions for connected cars, smart homes, supply chains, and manufacturing. The Active parking lot management solution works with multiple sensors that are mounted at 15 parking facilities in Stuttgart and transmit data to the Bosch IoT Cloud. Drivers can access the collected information and look for an available parking space either from a mobile application or via the website of the city’s transportation authority—Verkehrs- und Tarifverbund Stuttgart. Bosch believes this solution will effectively reduce carbon dioxide emissions by limiting the amount of time drivers spend looking for empty parking spaces. The TrackMyTools solution lets one control the location and usage of their power tools (e.g., hammer drills) both through the app and on the web. Its operation is based on Bluetooth modules that are mounted on tools. Every eight seconds, the modules generate signals that are picked up by the TrackMyTools app running on a smartphone or a tablet. Then, every 30 minutes, the mobile devices transmit these signals to the Bosch IoT Cloud together with such data as the current time, the user, and the most recent location of the device. 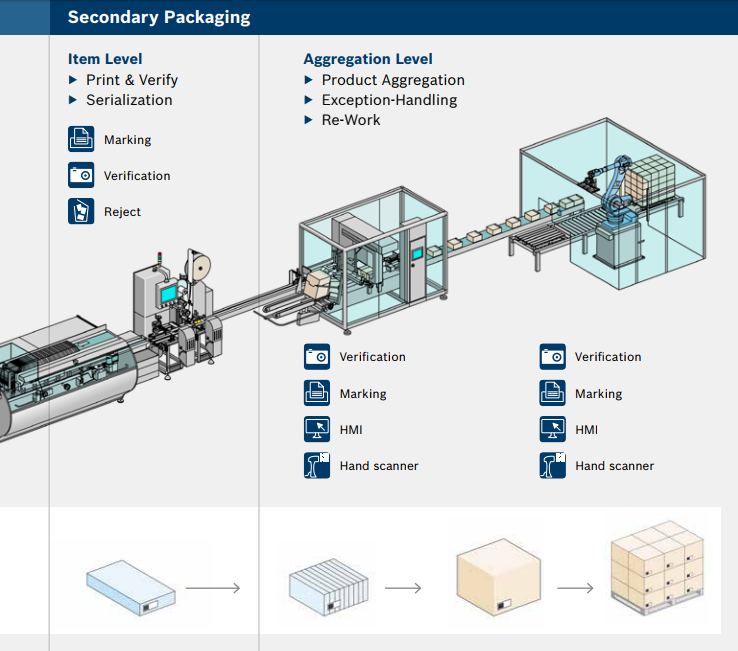 The Track and Trace solution uses multiple sensors installed in the packaging or directly on products, making it possible to track a delivery along the entire supply chain. These devices gather data about the ambient conditions (e.g., temperature, vibration, light, and humidity) that can affect quality and send it to the Bosch IoT Cloud. The software in the cloud compares the recorded values with the specified limits. In case a limit is exceeded, the solution generates appropriate notifications, enabling stakeholders to take immediate actions to minimize losses. The collected sensor readings can also be helpful in identifying the causes of a damage. Moreover, the sensors record location data, which can be used to calculate expected arrival times and improve transport management. Bosch Smart Home provides a single platform to connect heating, motion sensors, smoke alarms, and appliances at one’s home and manage them via a smartphone or a tablet. The centerpiece of the system is a controller that enables the Internet connection with the devices. Moreover, it stores all the data from smart home gadgets, so that users can be sure their data is kept safe from strangers. However, one can also access the information on a smartphone or a tablet, requesting it via the Internet connection. In this case, the data is encrypted before it is transmitted to the Bosch IoT Cloud. 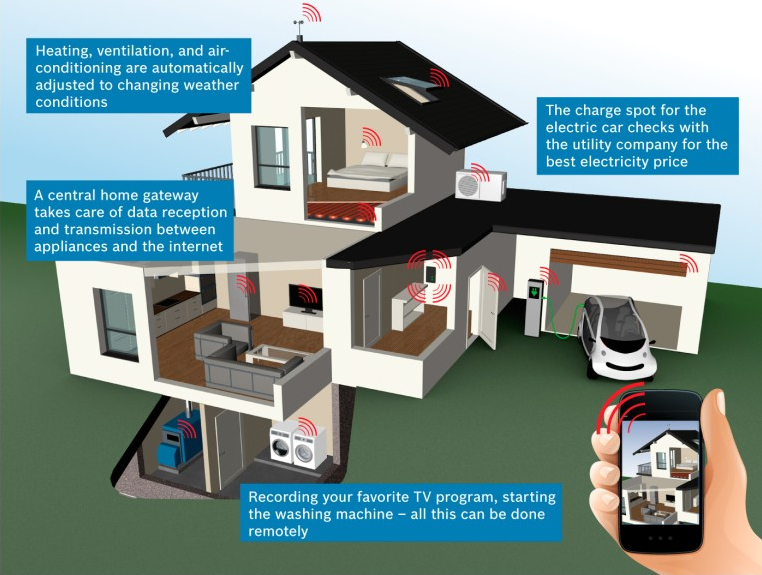 Bosch Smart Home can help users to save on utility expenses with features like intelligent temperature controls. It also adds an extra layer of security with smart motion sensors. 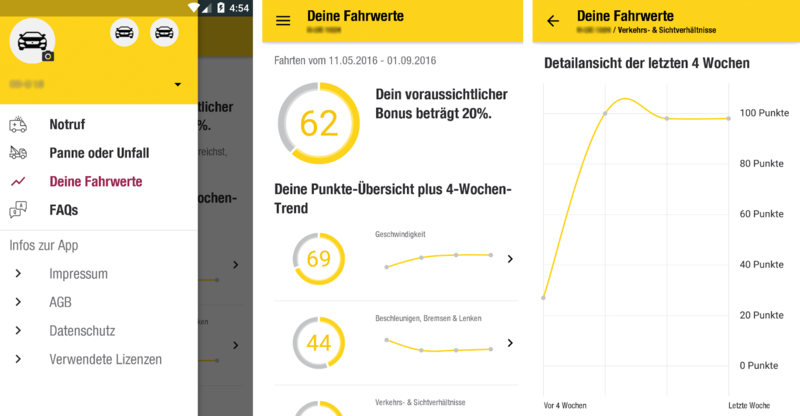 Partnering with Bosch, HUK-Coburg delivered a pay-as-you-drive app that makes use of the digital twin pattern to collect driving behavior data and then modify car insurance rates. Initially, the car insurance provider targeted drivers aged 25 and below with its SmartDrive tariff. With this app, HUK-Coburg expects up to 30% reductions in liability and casket tariffs annually. Its operation is based on a connectivity control unit. Mounted in a vehicle, the device transfers information about acceleration, sharp braking, steering movements, and location via a mobile network to the Bosch IoT Cloud. In this way, insurance companies can quantify the driver’s behavior to offer proportional bonuses and discounts. Bosch is also working with IBM to explore the potential uses of the blockchain technology in IoT. In three months, the collaboration has resulted in a proof of concept for countering fraudulent automotive parts. The solution is based on Hyperledger Fabric available in IBM Blockchain. The offering is delivered through the IBM Bluemix platform—another Cloud Foundry distribution. Bosch is also investigating how it can use blockchain to improve other processes and services in logistics, supply chain, sharing economy (e.g., car sharing), community-based parking, etc. In addition, blockchain can serve to ensure the accuracy of odometer and mileage data, as well as for creating a digital logbook with data like this. Another example is the Secure Truck Parking app, which is available through the SAP HANA Cloud Platform—an open PaaS integrated with Cloud Foundry. Using the SAP Vehicles Network, the app assists truck drivers in finding and reserving parking spaces in advance. According to Bosch, truck drivers, on average, visit four parking lots before finding a vacant spot. The solution not only saves time, but also provides additional security by choosing from those offerings that include complementary services, such as CCTV monitoring and 24-hour guards. Realizing that software has become a real power today, Bosch is determined to make the best of it to drive innovations and improvements across its workflows and products. The company is an example of how an established business with more than a 130-year history can not only survive the digital disruption, but gain more influence. 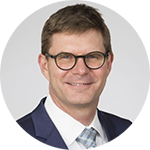 Steffen Evers leads the Open-Source Services team of Bosch Software Innovations. The team provides development services for open-source software (OSS) that is essential for Bosch and consults on strategy, community work, software management, and compliance processes in the OSS area. Steffen has researched, taught, and promoted open-source development and supported various companies in the use of OSS to achieve their business objectives. Mike Milinkovich is the current Executive Director at Eclipse Foundation. Since April 2012, he has been on the board of the Open Source Initiative, which is a non-profit organization dedicated to promoting open-source software. 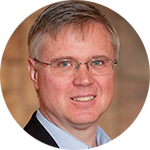 Mike has also served as a Vice President for Oracle and WebGain and as the Strategy Manager for IBM’s Visual Age IDE—the ancestor of Eclipse. He is a highly recognized figure in the Java community and a nominee for Top Java Ambassador. 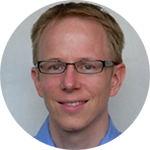 Mike is known for advocating OSGi as a solution for modularity in the Java programming language and against software patents. The post is written by Carlo Gutierrez, Alesia Bulanok, and Alex Khizhniak.